The greatest of Raphael's Madonnas in North America, the Alba Madonna, is in the National Gallery of Art in Washington,D.C. In this "Madonna of Humility", the Virgin is seated directly on the ground, rather than on a heavenly throne. The painting is a perfect expression of the art of the High Renaissance, the art of Leonardo and Michaelangelo as well as Raphael. 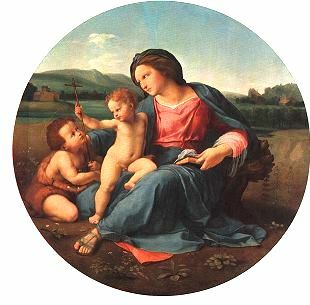 Harmony and balance are found in Raphael's ability to stabilize the circular form of the painting with a triangular arrangement of the figures and the strong horizontal line behind them, composed of the river and trees. The Virgin's sandal acts as a break preventing the tondo (circle) from rolling. The pastoral atmosphere of Raphael's painting is at odds with its emotional meaning. As the National Gallery observes on its web site, "The Christ Child's gesture of accepting the cross from the Baptist is the focus of attention of all three figures as if they know of Christ's future sacrifice for mankind."